Fans of the popular Deal or No Deal TV show are sure to enjoy this five-reel, 20-payline online slot. It boasts a number of symbols that those who’ve watched the television programme will be familiar with, and is a great option for players who like to customise games to suit them, with a minimum bet of £0.01 and maximum of £5 for each of the 20 lines. What this means, of course, is for as little as £0.20 you can get the reels turning with all potential winlines in play. Once you’ve settled on the number of lines and bet per line all you need to do is hit the spin button. If you’d rather sit back and watch the game unfold for a little while you can, as the Autospin feature allows you to start up for 25 games in a single click. The game’s Wild symbol is the Deal or No Deal neon logo and substitutes for all symbols except scatter. And the even better news for those who like to up their winnings (and who doesn’t?) is a doubled prized every time the Wild features in a winning combination. One of the most exciting elements of this slot is its bonus rounds. There are three in all, with one being triggered when three or more of the scatter symbol (the telephone) appear. The first is the Reel Banker, which provides nonstop free spins which will continue until the banker is revealed on line three. The second is the Banker’s Best Offer, which presents you with up to 10 prize offers, which can go up and down, so it’s up to you to say “deal” once you receive what you think will be the best offer. 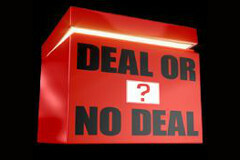 And last, but not least, is Deal or No Deal – The Jackpot! which gives you the chance to win the potentially huge progressive jackpot. With its impressive visuals and music those who watch the show will recognise, this is a game that is understandably popular. So, if you haven’t already had a spin why not give it a try now?